To some extent, the authors of the theme overview, J. Ross Pruitt and Joshua D. Detre, share the beef industry's view that the long controversy over this beef product is unfair to the industry. The use of the moniker “pink slime” is an example of how calling into question the safety and/or quality of a food product/production practice can do irreparable damage to the faith in the U.S. agricultural supply chain. As prices and markets continue to adjust due to the inability of ground beef suppliers to use LFTB, consumers are paying more per pound for ground beef. The LFTB case has impacts beyond the market price of ground beef, especially for the employees of BPI who lost their jobs and the communities who benefitted from the presence of BPI. While it is not yet clear if longer-term adjustments to the beef cattle industry will be tied back to the media scare over LFTB, it is evident that educating consumers about food production is a challenge not to be ignored. At the same time, the theme issue includes plenty of grounds for thinking the industry could have handled this matter better. For example, Erika K. Eckley and Roger A. McEowen review the history of the food disparagement laws, which BPI, the company responsible for LFTB, is using to sue ABC News following a feature story last year that criticized the product. This review makes these food disparagement laws look like awful public policy, and the authors doubt BPI will succeed. A long time-line of the history of 'pink slime,' on the Food Safety News website, recounts many low moments for this product, including a shipment of contaminated product that was the subject of an unsuccessful recall (apparently the product was sold before it could be recovered) and an occasion when the product generated complaints from food service workers because of strong ammonia smells. Important early coverage included this article by Michael Moss at the New York Times in 2009. The Council on Food, Agriculture, and Resource Economics (C-FARE), an AAEA outreach organization (for which I am a board member), is jointly sponsoring a media event and discussion on February 15 with the Federation of Animal Science Societies. To update an earlier post, here is my first attempt at home-made cheddar, following the recipe in Ricki Carroll's book on Home Cheese Making. Now this cheese and a companion batch I made a couple weeks later are aging until the middle of March in our basement closet. The cheese-making used the makeshift cheese press my son and I had fun building in December (though I recognize it's not much to look at!). The agricultural labor supply in Mexico may be shrinking, a development that is likely to raise wages for farm laborers in both Mexico and the United States. If this is truly a long-term trend, rather than a short-term response to economic recession or disruption because of recent violence, then it would have several implications. It could cause some difficulties for U.S. farm owners, and it could somewhat hinder efforts to encourage increased consumption of fruits and vegetables at low prices. On the positive side, it could help smooth U.S. immigration policy debates, and it would help alleviate hardship for the immigrant workers who play such a central role in the American food system. An analysis of nationally representative panel data from rural Mexico, with observations in years 2002, 2007, and 2010, suggests that the same shift out of farm work that characterized U.S. labor history is well underway in Mexico. Meanwhile, the demand for agricultural labor in Mexico is rising. In the future, U.S. agriculture will compete with Mexican farms for a dwindling supply of farm labor. Since U.S. domestic workers are unwilling to do farm work and the United States can feasibly import farm workers from only a few countries in close geographic proximity, the agricultural industry will eventually need to adjust production to use less labor. The decline in foreign labor supply to farms in the United States ultimately will need to be accompanied by farm labor conservation, switching to less labor intensive crops and technologies, and labor management practices that match fewer workers with more farm jobs. This article may be thought-provoking for readers who participate in U.S.-based sustainable food movements. For one thing, these movements have been trying to come to grips with labor issues, recognizing that even locally oriented and organic food production in the United States makes heavy use of low-wage farm workers. It is good that these movements have been giving greater attention to worker advocates, including the Coalition of Immokalee Workers and others, but this attention has to be accompanied by a fearless and honest analysis of the basics of labor supply and labor demand, which are more fundamental determinants of both wages and working conditions. For another thing -- and here I am generalizing a bit -- many of the thinkers and writers in this movement whose work I generally respect highly are nonetheless trade skeptics to a degree that makes me nervous. It is sensible to expect high standards from trade policy without straying quite so close to a nativist pessimism in which low-income trading partners are seen as bottomless pits of economic distress. The reason I am more optimistic than many of my friends about international trade is that I have not yet given up on the prospects for economic advancement that reaches even low-wage labor markets in the countries we trade with -- starting, for example, with Mexico. As Congress navigated its way through options to avoid the fiscal cliff in the final days of 2012, federal dairy policy shared part of the spotlight. In the end, Congressional actions included a nine-month extension of the Farm Bill, averting a legal mandate that had the potential to cause milk prices to more than double. The challenges and opportunities of U.S. dairy policy will be the focus of the Farm Foundation® Forum on Wednesday, Feb. 6, 2013. The Forum will be 9 a.m. to 11 a.m. EST at the National Press Club, 529 14th St. NW, Washington D.C.
Mitch Davis, Davis Family Dairies, Le Sueur, Minn.
After the speakers' brief presentations, the floor will be opened for discussion. 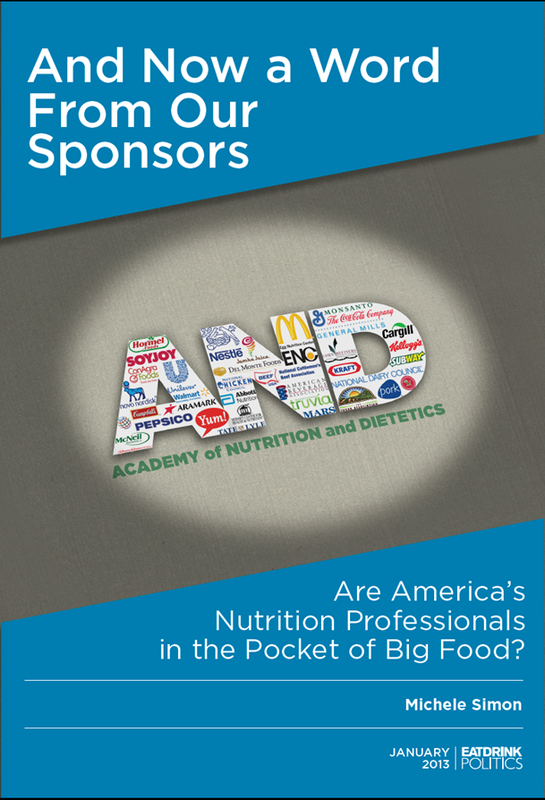 The Hunger and Environmental Nutrition (HEN) practice group within the Academy of Nutrition and Dietetics (AND) has long been encouraging greater transparency about corporate sponsorship issues. The AND (formerly known as the American Dietetic Association) serves as an influential advocate in U.S. nutrition policy and also as the professional association for registered dietitians. My students and former students who are registered dietitians have worried about AND corporate sponsorships. They send me a steady stream of awkward examples of ill-chosen sponsorships, for example with sugar sweetened beverage companies and meat checkoff programs. One Friedman School graduate student, Ashley Colpaart (who for some years co-blogged here at U.S. Food Policy), has been proposing reforms for AND's corporate sponsorship practices for many years. ADA’s corporate sponsorship program has become a topic of public discussion in recent years. A total of 370 HEN members were surveyed to shed light on member opinions of the corporate sponsorship program and whether our DPG approves or disapproves of the program. The majority of survey respondents appear to disapprove of the corporate sponsorship program, indicating that it negatively impacts their public image as food and nutrition professionals. Additionally, 61% of respondents were willing to pay higher ADA membership fees in order to decrease reliance on corporate sponsors. [R]egardless if they are real or perceived, the influence of Academy corporate sponsors has not only sparked scrutiny among journalists, but has led to several conversations in which members have had to defend these relationships and the profession at national conferences and forums. These confrontations have led to rising humiliation and a growing discomfort while fulfilling the role as Delegates. In some instances, this has led to long-­‐time members leaving the organization. We urge the Academy to uphold more transparent and stricter guidelines on access of corporate sponsors to Academy leadership and to remove their presence at meetings, such as HOD [the AND House of Delegates], in which decisions about the profession and/or the organization are made. This will avoid conflict of interest, advance transparency, maintain professional and organizational integrity, and establish a more credible national presence. It is difficult for any professional association to find a business model that works, providing needed support for association activities without conflicts of interests. For example, the HEN practice group itself last year sought to develop its own policies for sponsorships (.pdf), describing the ideal potential sponsors as companies with a combination of nutrition and environmental virtues. I wish them well finding such terrific sponsors, but, realistically, we should admit that giving up compromised sponsorships may imply accepting a smaller scale of operation and revenue for a professional association. Even recognizing those difficulties, it would have been wise for AND to listen to the input from its own internal rank and file. As an outsider to AND, nutrition policy advocate Michele Simon offers much harsher criticism of the Academy in her report this week. With hindsight AND leaders might wish they had listened more sympathetically to internal concerns before matters came to this point. When Marion Nestle blogged about this issue yesterday, generally agreeing with Simon's report, some of the open comments from dietitians were defensive, while others agreed with the concerns about corporate sponsorship. Nestle has a very good follow-up post today, responding to the discussion so far. The New York Times also covered this issue, which is unlikely to just fade away any time soon. Timed to coincide with the inauguration, Tufts University's online news and features site TuftsNow this week invited six faculty members to offer comments in advance of the second Obama administration. Harris Berman (dean of the School of Medicine) addressed health care. James Glaser (dean of academic affairs in Arts and Sciences) focused broadly on legislative opportunities. Michael Klein (Fletcher School of Law and Diplomacy) tackled economics. Sociologist Helen Marrow discussed immigration reform. Chris Swan (associate dean in the School of Engineering) emphasized infrastructure. And I commented on food policy. 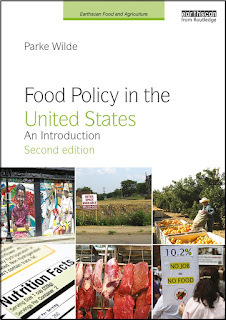 Parke Wilde, associate professor, Friedman School of Nutrition Science and Policy; author of the forthcoming book Food Policy in the United States: An Introduction (Routledge/Earthscan). Improve agricultural policy. Traditionally, U.S. policymakers have worried that food prices are too low, and farmers are less prosperous than non-farm households on average. Now environmental constraints and a growing world population have increased prices and raised concerns about food scarcity. This scarcity is mostly a challenge, but it does also present an opportunity to reform U.S. agricultural policy. Support reforms to traditional crop subsidies, limit payments to high-income farmers, and resist the temptation to use subsidized crop insurance and corn-based biofuels incentives as a back door to maintaining outdated subsidies. Improve the healthfulness of food retail and marketing. Continue to support the First Lady’s Let’s Move campaign, including promoting local retail access to healthy foods using moderate budgetary support, taking some care to avoid unnecessary supermarket subsidies. If some health-promotion measures are too bold for legislators to support today, such as soda taxes or marginal changes to Supplemental Nutrition Assistance Program benefits, then conduct pilot programs with strong evaluation designs to collect the information for sensible future policy decisions. Protect food safety and the environment. Vigorously implement the new Food Safety Modernization Act. Raise awareness of the role of the food system in water scarcity, soil loss and climate change. Americans are a decent people. We might be willing to get along with less meat, less packaging, less energy intensity and less waste if we have the right price signals and a clear vision of how to do so. 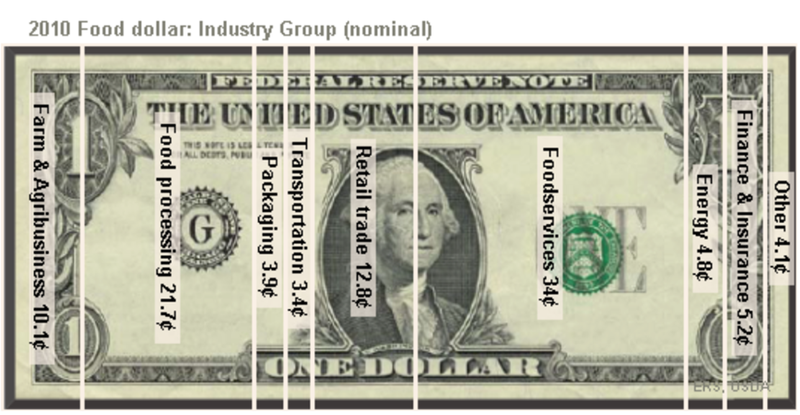 USDA's Economic Research Service has long published a well-known graphic illustrating the food value chain as a dollar bill, with each segment showing a particular industry's contribution to the average consumer dollar spent on food. A key insight from this graphic is that farmers on average receive only about 10 cents for every dollar of consumer food spending. 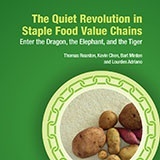 It may be more surprising to hear how rapidly value chains around the world are changing, even for staples such as rice and potatoes. A December report from the International Food Policy Research Institute (IFPRI), by Thomas Reardon, Kevin Chen, Bart Minten, and Lourdes Adriano, describes this change as a Quiet Revolution. Although the supermarket-ization of the food system in developing countries introduces risks and challenges, the report seems to me fairly upbeat. It emphasizes several ways that economic development of the value chain can offer benefits for poor farmers and consumers, leading to improved food security. To supply the megacities of countries like China, India, and Bangladesh with sufficient food, we cannot think just about traditional farmers selling raw commodities to a local merchant trader. Instead, it is necessary to come to grips with modernization even in the food system that serves the world's poor consumers. 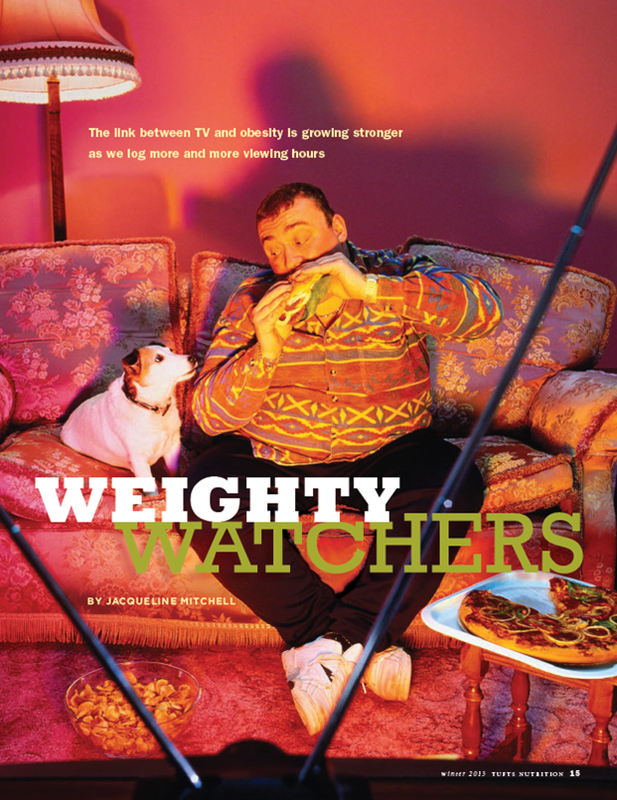 In the current issue (.pdf) of the magazine Tufts Nutrition, Jacqueline Mitchell describes recent research on television viewing and weight status. Americans spend an average of more than 150 hours a month in front of the television — that’s six days—and never mind other sedentary hours we spend with computers or mobile devices. As our screen time has exploded, so has the national waistline. Two-thirds of adults are overweight, and childhood obesity has more than doubled in the last 20 years. One reason obesity may be on the rise is that people who watch a lot of television may eat more, particularly pizza, soda and other fast foods, according to a recent Tufts study that evaluated 30 years of research linking TV viewing with weight gain. The paper, written by four students and their adviser, Robin Kanarek, Ph.D., interim dean of the Friedman School, was published online in the June 4 edition of Physiology and Behavior.... The research by Kanarek and the students—Rebecca Boulos, N13; Emily Vikre, N08, N13; Sophie Oppenheimer, N11, MPH11; and Hannah Chang, A10—also indicated that television can shape societal views about overweight and obese people. In food advertising and labeling law, there is a concept called "puffery." It means advertising or labeling claims so outlandish that reasonable adults will recognize their falsehood. You might think that health advocacy groups would use the word "puffery" as an insult when describing food company advertising. Not so. Instead, it is the food companies who use the word "puffery" in legal briefs defending their own advertising. As in: "Sure, our advertising claim was false, but so what? Our claim was mere 'puffery.' We have no legal obligation to stand by its truth." I thought of this arcane field of puffery-related law while watching Colbert's coverage of the Coca-Cola VitaminWater lawsuit this week. The Institute of Medicine, part of the National Academies, today released a consensus report on the adequacy of Supplemental Nutrition Assistance Program (SNAP) benefits. The committee that prepared the report was led by Julie Caswell of UMASS Amherst. Members included Mary Muth, Philip Gleason, Jim Ziliak, Barbara Laraia, Diane Schanzenbach, and others. The committee had invited me to Washington for a workshop in spring 2012 to give a presentation (.pdf) about the economics of the SNAP benefit formula, the procedure that the federal government uses to assign a benefit amount to each participant household based on its income and other characteristics. adjusting the earned income deduction to reflect more accurately time pressures for participants who are working. One question is whether encouraging greater food spending on convenient foods would have any health or environmental consequences. For example, convenience foods tend on average to have more sodium and more packaging than their traditional counterparts. Clearly, an increased benefit to allow for convenience foods would be a special boon for highly time-constrained households -- think for example of the dreadfully tight time budget for a low-income working single parent. Yet, many other low-income SNAP participants are retired, or live in households that include a non-working adult. Some low-income households are able to -- and even want to -- cook at home. For these households, it might be counter-productive to increase the maximum benefit to a level based on the price of expensive convenience foods, while simultaneously forbidding the households to economize on food and use the savings for non-food needs such as housing and transportation. While you're thinking this over, I thought it would be helpful to conclude with some real data from the American Time Use Survey for 2011. Most of the leisure time segment at all education levels is for television and other screen-time recreation. Source: American Time Use Survey. Note: the amount of work time appears smaller than you may expect, because the data include both weekdays and weekends, averaged for working and non-working persons aged 15 and older. Sound Medicine: How does farm policy affect the nation's nutrition and health? I recently spoke with Barbara Lewis at the Indiana NPR program Sound Medicine about the Farm Bill and nutrition. The program website has full audio. Here is the abstract from the program. Veteran food industry journalist Chuck Jolley recently discussed the pork checkoff program with Wayne Pacelle, president of the Humane Society of the United States (HSUS). Jolley asked Pacelle if the recent HSUS lawsuit against the pork checkoff program was "legal shenanigans" or a substantial case. Pacelle's response noted some recent reporting on the U.S. Food Policy blog. A: You can read our complaints. We have (hard evidence) that the Pork Board used check-off funds to participate in NPPC lobbying events. NPPC says the charges are baseless, yet it quickly acted to remove evidence of the Board’s high-donor “Partner” status in its Alliance lobbying program. Within days of the HSUS complaint, the U.S. Food Policy blog reported that the Pork Board had been (removed) from the Alliance website. HSUS and pork farmers also filed a (complaint) over the $60 million pay-out from the Pork Board to the NPPC for the use of the ‘Pork: The Other White Meat’ slogan. NPPC used $500 million from the checkoff to make the slogan successful, so producers should not have to pay again for it, especially in light of the slogan being put to bed. A friend taught me how to make this oat/wheat combination bread. While some bread recipes save time by using just a single rise, this bread has two rises, but there is a twist that makes it quite friendly for people with a day job. The first kneading is at night. The following morning, the steps for putting dough in pans, allowing a second rise, and baking, each take just a few seconds and seem timed just right to fit between morning tasks of waking up, showering, dressing, breakfast, and out the door. By some measures you'd have to say home-made bread takes hours of work, but if we choose a recipe that fits our schedule, we get three loaves of fresh bread for about 45 minutes' work (in the evening, in the kitchen, with music on the radio, sometimes with kids around chatting, at a time of day when I didn't want to do other work anyway). As I smell this bread before eating it the next evening, I think there are some things that statistics on food prices and time use will never quite measure. Many readers of this blog seek to make environmentally sustainable food choices. Good choices include eating food with less meat, less processing, and less food packaging. We can choose food sourced in season and closer to home. We can waste less. For some of us in first-world countries, the benefit of these choices is more than offset by the impact of frequent flying. The book by Berners-Lee, How Bad Are Bananas?, which I discussed a couple months ago, gives the technical details on greenhouse gas estimates. Buses and trains have vastly lower impact, and even automobile driving is much better so long as the vehicle carries multiple passengers. In the New York Times recently, M. Sanjayan, the lead scientist for the Nature Conservancy, reflects very briefly on the paradox of environmentalists who frequently fly. I see earlier commentaries in recent years by Anna Guyer (with an interesting comment thread) and others. In 2006, George Monbiot wrote that we are all killers until we stop flying. Still, basically, this question seems to be discussed quite rarely. For those of us who fly frequently, we each offer reasons. We tend to describe our motivation as "necessity" rather than "desire" to fly. We must fly because of work. We must fly so that children can know their grandparents. But there surely is an awful pile of assumed privilege in these claims of necessity. It is not just that most people in the world never fly; most people in the United States do not fly even once in any particular year. The concept of flying as a necessity is confined to a small elite. When I travel by train for business trips, I feel a higher quality of life. Boston's South Station is walking distance from my office. The homeland security apparatus is more humane. The trains now have wi-fi and fairly good working conditions. The views of the Connecticut shoreline, New York City, and the Susquehanna are striking. An hour before the destination, one can shut down the laptop and go to the cafe car for a beer. As I watch the news about climate change, replacing just one or two plane trips with alternative transportation modes does not seem sufficient. Is it possible for an active university-based researcher not to fly? Would colleagues think I had become unhinged? I wonder, who is the highest-profile academic researcher in the United States who does not fly? How does he or she do it? I once went 15 months without flying for work. In advance, when I told my colleagues over drinks at a conference reception what I planned to do, they laughed. "Sure, let me be an environmentalist too and spend more time with my family!," one said. Is it possible that millions of American professionals are squandering the environmental commons by packing ourselves like sardines into aluminum flying tubes, at great expense, with no welfare benefit? It would be ironic if we each fly joylessly out of obligation to other people who simultaneously flew joylessly in order to meet us. Not just ironic, it seems insane. Before deciding what to do about this, my family and I are spending some months discussing it with family and friends, including with relatives in distant places. If you have any thoughts, or web links or reading suggestions, feel free to share. There may be an update in a future post.